Standing on the western edge of the historical centre of the city, its elegant façade overlooks the other nineteenth century architectural glories of the Prado and Parque Central. The interiors, designed by European consultants, are simple, spacious, elegant and exceedingly comfortable. All the rooms have up-to-the-minute technology, the mudéjar-style restaurant is very attractive and the central courtyard has been glazed over and air conditioned. From the top-floor pool guests can enjoy a spectacular view of both ancient and modern Havana. 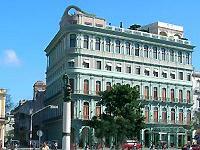 Hotel Saratoga is located in a previleged spot in Havana, in front of the National Capitolio, tobaccos factory Partagas and nearby the Great Theater of Havana. It is Old Havana’s grandest hotel, having been carefully designed for especially discerning travellers who wish to combine cultural and historical exploration of the city with enjoyment of its world-famous nightlife.